In Anacortes, Wash., last week, approximately 200 Tesoro workers began picketing the oil refinery where an explosion incinerated seven of their co-workers five years earlier. Butch Cleve walks that picket line, serving now as strike captain for the USW local union at Tesoro. On the day of the catastrophe in 2010, Cleve walked the coroner to the shrouded bodies of three of his friends. Steve Garey, who helped make the decision to strike as a member of the USW’s oil bargaining policy committee, wept repeatedly that April day five years ago as he told the relatives of his dead friends that their loved ones would never come home. Kim Nibarger, a USW health and safety specialist, suffered flashbacks of an earlier blast as he investigated the one at Tesoro. He was an operator in 1998 at the refinery adjacent to Tesoro in Anacortes when a massive detonation instantly cremated six of his co-workers. The Tesoro strikers are among more than 5,000 USW members nationwide on unfair labor practice strikes demanding corporations respect their bargaining rights and the rights of workers and communities to safety. Over the past two negotiation cycles, the USW’s 30,000 refinery and chemical workers struggled to persuade their highly profitable employers to include strong safety language in the collective bargaining agreements. The deaths at Tesoro, as well as fatalities, injuries, explosions, fires and toxic releases at other plants nationwide since then, demonstrate that the measures didn’t go far enough. Now refinery and chemical workers are trying to increase the odds that they aren’t killed at work and that their communities aren’t engulfed in flames or fumes. 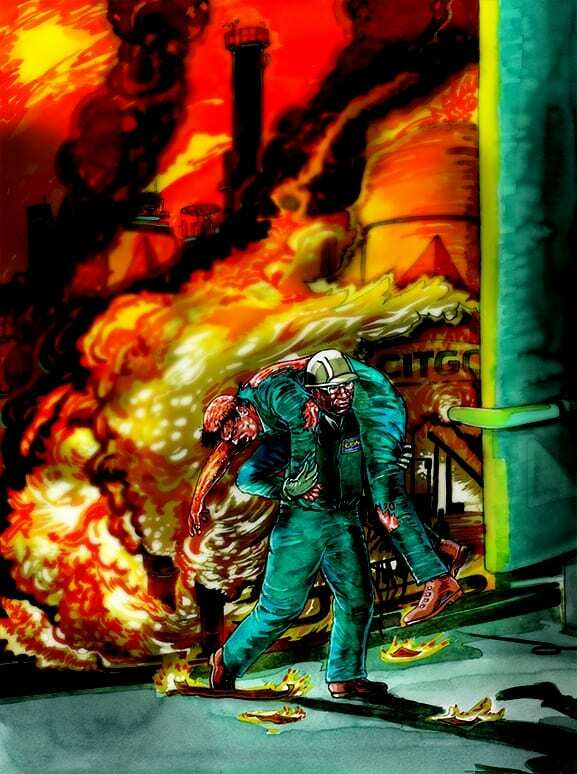 Artist rendering of USW member Charles Wharton carrying a critically injured co-worker to safety after the 2009 explosion at the CITGO refinery in Corpus Christi, Texas. Art by Frederick H. Carlson of Carlson Studio. The blast occurred a little after midnight on April 2. Steve Garey was at home, asleep. His sister in Seattle, up late, heard a news bulletin and called him. Garey got to the refinery at about 5:30 a.m.
Garey, a machinist at the refinery who served on the local union’s negotiating team then, said some Tesoro officials asked him to help them break the terrible news to families after the company’s first visit went poorly. “I spent the bulk of that first day travelling to people’s homes with stone-faced supervisors,” Garey recalled. His face, by contrast, was crumpled in grief. “All you can do is go in and cry with them, hug them, tell them how you feel and let them know they are not alone,” said Garey, who now serves as the local union’s president. The four taken to the hospital were horribly burned. Two died that day, one later that week, and the fourth within a month. After escorting the coroner to the places where the bodies lay, Cleve stayed at the plant another 15 hours, trying to console his co-workers. “The people from the area of the blast in particular were my concern at that point,” he said. “It was kind of taking care, talking to people, gauging them and trying to offer whatever moral support I could.” Other union leaders did the same. “Some people were in shock. Some were inconsolable. Some were just in a haze,” recounted Cleve, who was a process equipment operator then but now works full-time on safety. Cleve said he was angry that the company knew this equipment had a history leaks and fires and hadn’t made the repairs necessary to prevent the catastrophic failure. “A big part of this strike is that none of us wants to be the next person to lose his life for no good reason,” he said. He knew it was an explosion at one of the two refineries in Anacortes. He drove to an overlook and saw flames at the Tesoro refinery and helicopter landing lights flash on at the community hospital. He was the local union president at the neighboring refinery in 1998 when an explosion instantly killed six workers. That time, he was driving with his parents to a restaurant across the highway from the plant for lunch when he saw smoke and flames. His pager went off, summoning emergency responders. He was among those who volunteered to go into the unit and retrieve the bodies. He described the condition as charcoaled. Like Garey, Nibarger spent a lot of time crying with victims’ families. Since 2004, Nibarger has worked full-time on the staff of the USW International trying to prevent these catastrophes. But he’s frustrated. Off the top of his head, he can cite fatal case after fatal case. In 2012, highly toxic hydrofluoric acid was released from the CITGO East Refinery in Corpus Christi, Texas. This followed an explosion in 2009 when the deadly acid escaped the perimeter of the same refinery and a fire that critically injured a worker burned for several days. Also in 2012, a fire at a Chevron refinery in Richmond, Calif., sent 15,000 members of the community to hospitals with breathing problems. Richmond has sued the company accusing it of placing profits over public safety. In 2013, a heat exchanger explosion at the Williams Olefins Plant in Geismar, La., killed two workers and injured 114, in what the Occupational Safety and Health Administration said was a serious violation of safety practices. Also in 2013, a heat exchanger fire at ExxonMobil’s Beaumont, Texas, refinery killed two workers and injured 10, some critically. The Occupational Safety and Health Administration (OSHA) cited ExxonMobil and two other companies involved for safety violations. In 2014, two workers at the Chevron Phillips Chemical plant in Port Arthur, Texas, were severely burned in a flash fire. Just three weeks ago, a worker fell to his death at the CITGO refinery in Corpus Christi, Texas.